Like a lot of guys, I consider myself to be a slightly adventurous kind of Dad. Perhaps some things I enjoy are a tad adolescent. But I think there is a certain undeniable element of manly joy that can only be found while buzzing at my wife with toy helicopters, watching war movies, and holding my son in such a way that women everywhere scold me. These past few weeks, I have been excited to delve into the stories of Louis Silvie Zamperini and Chris Kyle. With both men, you have tales of resilience, bravery, and victory against insurmountable odds. 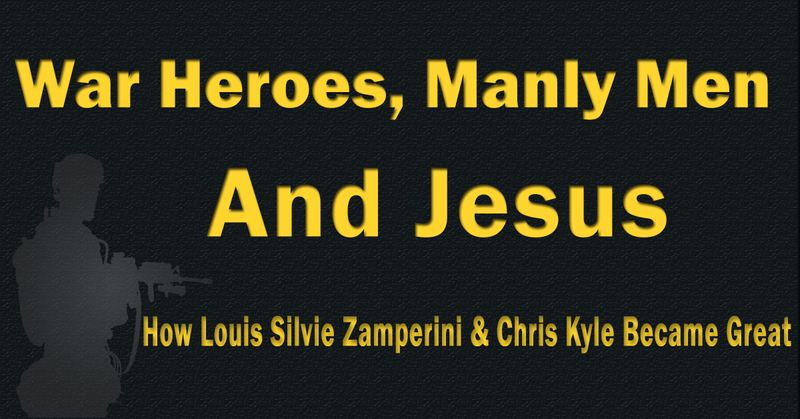 When I read about how Zamperini drifted in a rubber raft for over a month without supplies or of how Kyle dove back into combat with leg infused with shrapnel, I was hooked and wanted to know more about these men. Hoorah! But as exciting as those stories are, we must remind our souls and our sons that acts of valor do not usher one into manhood. In both stories, the men were actually undone by their wartime feats. At the conclusion of WWII, Zamperini returned to America a drunk tormented by nightmares of his Japanese concentration camp commander, the “Bird.” And Chris Kyle’s battlefield experiences in Iraq left the sniper a bar fight enthusiast who struggled to connect with his wife and kids. As both men learned, bravely fighting “savage, despicable evil” does not necessarily make someone great man (p. 4). For us and our kids to be godly, heroic men, we don’t have to paint our faces with animal blood, hit home runs, or have a wall collapse on us (though there is nothing wrong with any of these things). Rather, we have to acknowledge that the greatest evil is not “out there, somewhere” but within us. We have to come to grips with the wickedness in our hearts and stop believing the lie that we are “basically good people.” As Jeremiah wrote, “The heart is deceitful above all things, and desperately sick; who can understand it” (17:9)? To be great men, we must humbly submit to the command of Christ. And Christ is what made these men great. Louis Zamperini embraced Jesus in October of 1949. And once he repented of his pride, the former aviator found immediate relief from alcoholism and his nightmares in the hope of Christ. Because Zamperini had been forgiven much by God, he was in turn able to forgive his captors, creating an incredible story of hope and redemption! And though Kyle also struggled with adjusting to civilian life, he too found his hope in the Christian faith. By trusting in Christ to deliver him from his sinfulness, the former SEAL was able to make sense of his life and save his marriage. At the end of the day, the manliest of men are not the ones who buzz their wife with a toy helicopter (I know, this is a no brainer), run in the Olympics, or earn the most sniper kills in U.S. history. The most remarkable men are those who embrace Jesus and follow him with all their heart soul, mind, and strength (Mat. 22:37). Kyle, C. (2012). American Sniper. New York : HarperCollins.